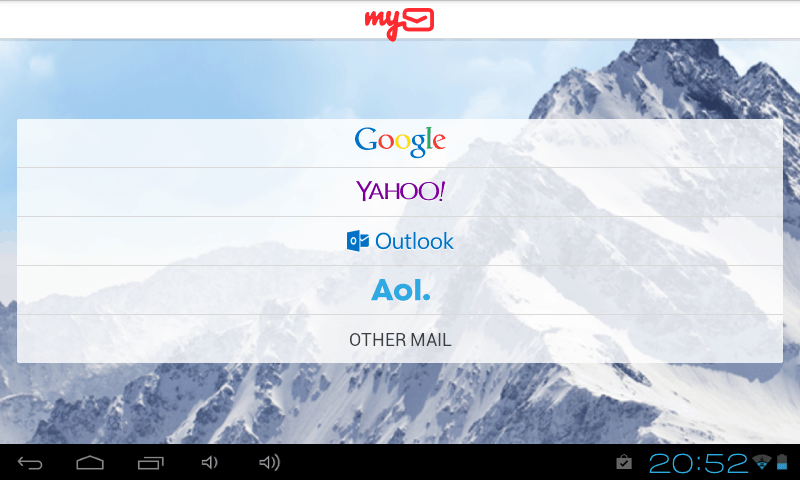 myMail is a simple, attractive, and fast little app that brings all your email accounts into one user-friendly interface. It is compatible with Gmail, Yahoo, AOL, Hotmail, Outlook, iCloud and a lot more email providers. It runs on smartphones and tablets, both Android and iOS. It is a delight to navigate with swiping motions that open up easy to sort out windows where you can read, compose, forward, reply to your emails, and chat with your friends. myMail sports a clean-cut, simplistic interface that reminds of Gmail, as it’s user-friendly, bright and has every option where it belongs, so users won’t waste their time looking for something. myMail’s GUI makes it incredibly easy to focus on what’s important by combining simple colors and typography to remove distracting information from the screen. myMail offers convenient previews and a visual built-in attachment viewer. Navigating the application takes a swipe to the left to see the inbox, or add another account; or to the right to read, compose, or reply to messages. Push notifications allow you to receive notifications of new incoming messages as soon as they appear in your inbox, irrespective of whether your email client supports this feature, or not. Users can turn these notifications off if they don’t want to receive them, or filter them. For example, if you don’t wish to receive notifications of incoming messages from a specific person, you just turn them off. You can set a “quiet time” and receive no notifications while you work, or rest. A bright and customizable inbox allows users to navigate the list of messages in a fast manner where they can see their friends’ avatars, therefore, making it easier to identify important messages, as well as tagging messages from important services. Users can turn the avatars on and off according to their specific needs. A smart built-in search tool allows searching instantly through all messages and contacts, as well as composing your emails faster with phrases and contact suggestions. myMail will have access to your device’s address book, and the next time you compose your email it will have the list of all your contacts, so you don’t have to check out in multiple email clients for a specific contact. The app makes it easy to share photos that are stocked in your phone or tablet, offering a convenient way of adding multiple images to a message. Advanced users will appreciate this little application for its speed and responsiveness; it offers impressive data compression which saves bandwidth. Moreover, at myMail they seem to understand the importance of encryption, so irrespective of your network security, be it private or public Wi-Fi, myMail encrypts your emails and information by using the latest security protocols to protect your data’s privacy and integrity. myMail understands the importance of privacy in one more aspect: you can make push notifications private by hiding the senders information or the subject of the message, thus preventing it from popping up on your screen. myMail makes it possible to forward emails without downloading them. It has all your contacts in a single database, so you have frequently used contacts handy. It offers a simple, easy to navigate, attractive graphical user interface. The program is fast and responsive; it didn’t crash, freeze, or offer any annoying pop-ups during our test. The in-built search option allows to find easily relevant emails and contacts. Previews allow you to have an idea of what is in the image without downloading it. Email and data encryption is one of its best features granting you some peace of mind in terms of privacy and security. While having all contacts in a single address book may seem like an advantage to some users, the same feature may be a concern to others because of too much user relevant data is collected into a single application. Other than that, we could not identify anything to point a finger at. 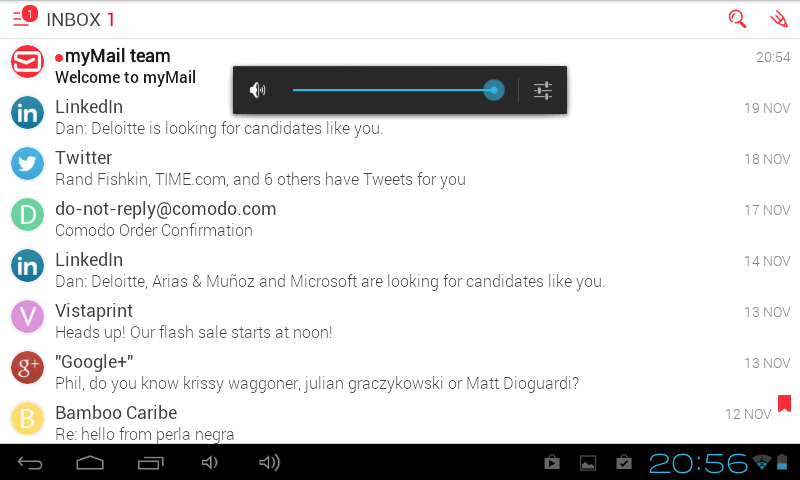 Android devices could use a decent native in-built email client that would be at par with the one you have in iOS. The endless variety of email clients available on Google Play makes it difficult to choose a third-party solution to address your Android email concerns. Here are a few alternatives that have proven to be viable over the years: K-9 mail is a very popular choice; it comes free of charge, but doesn’t have a conversation view. 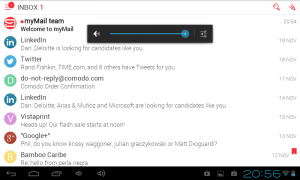 Mail Droid is also free and offers the conversation view, but it has a significant drawback – if you delete an email that you are reading, you are automatically taken back to the inbox. It also offers annoying banner ads you can get rid of by upgrading to the Pro version which costs $18. Enhanced E-mail also seems nice and has many options, but it doesn’t offer conversation view. Entrusting your emails to a third-party software is an issue in itself. I would’ve felt a lot more confident with nifty and feature-rich native Android application to process emails from multiple email accounts. 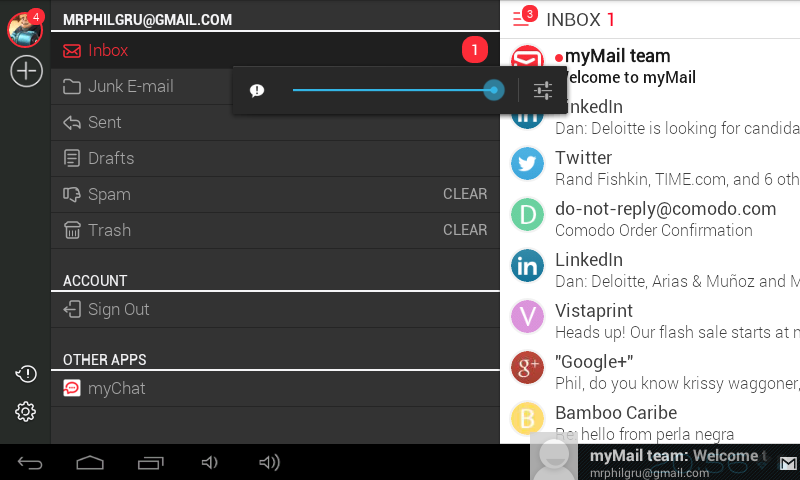 Since native Android email application leaves much to desire, users have to resort to third-party apps. myMail is currently one of the best solutions to your email woes. Our Android smartphones and tablets allow us the luxury of playing 3-D games, working online, driving with in-built GPS, but sorting out emails is a pain. 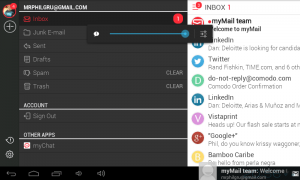 myMail application addresses this issue in many aspects, and so far it is a viable alternative for Android users, but iOS devotees may feel reluctant to migrate from a feature-rich iOS native email application.